I love Fall like a dog loves bacon. Like Freud loves his mother. Like Pooh loves honey. Today in New York we’re in the mid-70s. Hello Fall! Maybe that’s why I’m all up in Fall’s business with lunchbox treats these days. But Newtons are a code I’d been planning to crack for a long, long time. I didn’t want to get it wrong. You don’t wanna mess with nostalgia, and get it wrong, you know? I have no particularly fond memories of fig Newtons, truth be told. In fact, my first Newton was almost undoubtedly an apple Newton. But since I’m saving all of my best apple recipes for later, I went with cherry-filling. Adding some dried plums (okay, prunes, but dried plums sounds a whole lot more appetizing, on account of the function which prunes are known to serve) to the filling helps create just the right consistency. Be sure not to roll the dough out too thin, or you won’t get the proper soft-but-toothsome *bite* in your cookies. 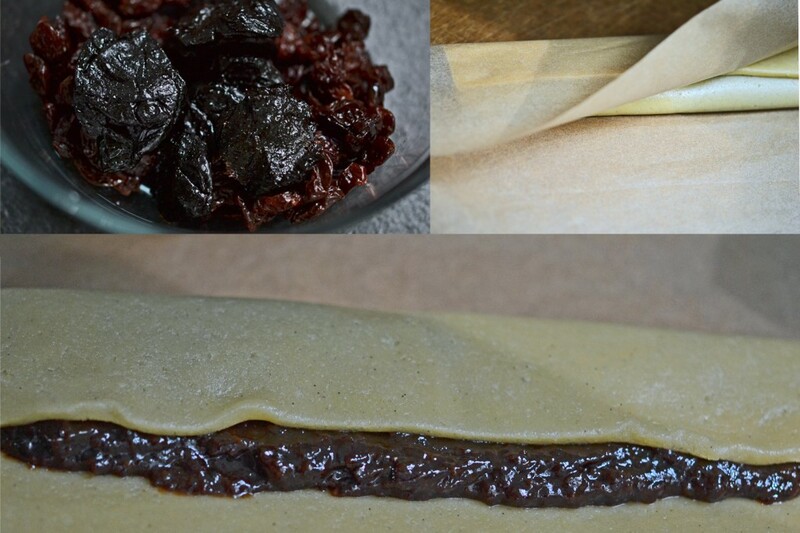 The dough is moist, so you will get the cleanest results in folding it over the filling by using the parchment paper, rather than trying to peel the rolled-out dough from the paper (see top right photo above). And they cut nice and clean when you freeze the filled dough before slicing it with a sharp knife. In a food processor fitted with a steel blade, place the dried cherries, dried prunes and honey or Lyle’s. Turn on the food processor and puree until smooth. The mixture should be thick but spreadable. If it seems too thick to spread, add tepid water by the tablespoon and pulse to combine until you reach the desired consistency. Preheat your oven to 350 degrees F. Line rimmed baking sheets with unbleached parchment paper and set them aside. In a large bowl, place the flour, xanthan gum, salt, granulated sugar and light brown sugar, and whisk to combine well, working out any lumps in the brown sugar. Add the butter, eggs and vanilla, and mix until a dough comes together. Knead briefly until smooth. Divide the dough in thirds. Place one third of the dough in between two sheets of unbleached parchment paper and roll into a rectangle approximately 9-inches by 12-inches, and slightly less than 1/4 inch thick. Remove the top sheet of parchment paper and trim any rough edges with a pastry cutter. Place one-third of the dried fruit mixture in the center of the rectangle and spread lengthwise across the center third of the rectangle. Gently lift one long portion of the bottom sheet of parchment paper and use it to fold the dough over the filling. Peel back the parchment paper and repeat with the other side of the dough, overlapping the dough. Place the filled dough in the freezer for about 10 minutes or until firm enough to slice easily. Repeat with the remaining 2 pieces of dough and remaining 2/3 of the filling. 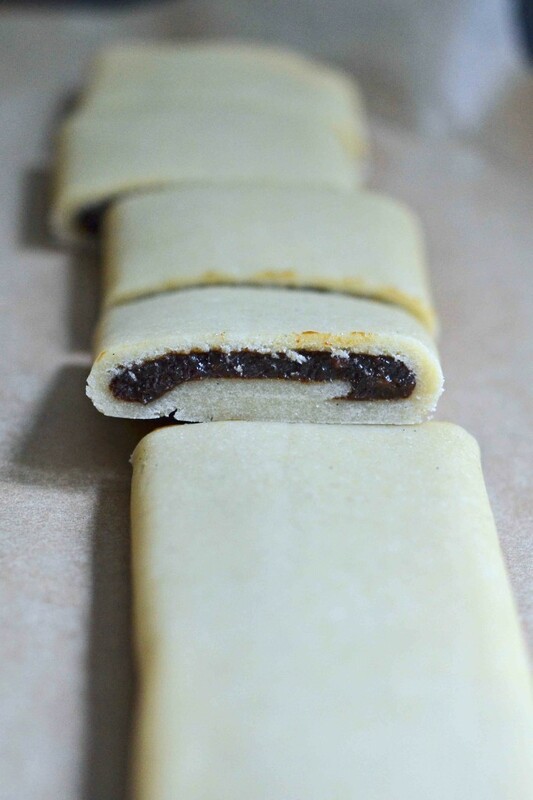 Remove the filled pieces of dough from the freezer and slice each in cross-section into 8 cookies. Place the cookies, seam-side down, on the prepared baking sheets about 1 inch apart. Place the baking sheet in the center of the preheated oven and bake, rotating once during baking, until the cookies are puffed, light golden brown around the edges and pale golden on top, about 17 minutes. Remove from the oven and allow to cool completely on baking sheets. Serve at room temperature. Store cookies in an airtight container at room temperature for about a week. Freeze any remaining leftovers. P.S. If you haven’t yet, pick up a copy My Cookbooks! Remember, I need your support to keep the blog going! I was a “newton” junkie…so these will be made SOON! I don’t even have to shop since I have everything I need to make them NOW! Super super awesome! Nothing like instant gratification, Chris! These where SOOO good. Totally worth warming up the house (turning the oven on) on a 85* degree day. I ended up using dried cranberries (that’s what I had) and they worked just fine. 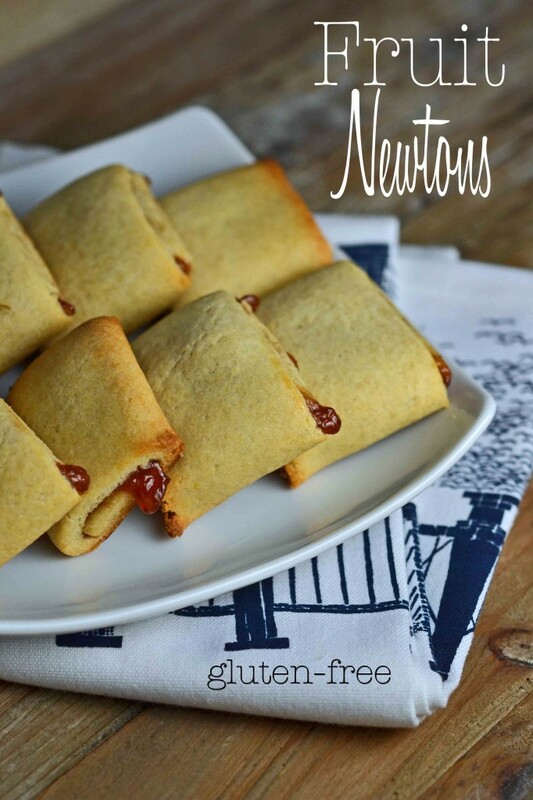 Oh, how my husband loves fig newtons!!! !I’m sure he is going to love these.Many thanks.Will let you know how they turn out with figs after I go buy the figs. Bwahaha… I just looked at the other comments and I answered my own question about your cookbook. I’m so excited! PS- I love the new blog look! PPS- when exactly is the new cookbook being released? If I saw you, I personally would hug you for “bet your buttons” alone. Oh, and glad you got your info about the cookbook, and thanks for the kind words about the new blog digs! Will your newest cookbook be available for Kindle as well as the first one was? I LOVE your recipes!!! Thank you for the nice note. Yes! The new book will be available for the kindle. In fact, the “release date” for the book is October 16 (although the official publication date is November 6), and although I have to check on this to be 100% sure, I believe that the kindle version should be available for download on October 16. I will check on that though and update this comment if I am wrong! If I want to sub thick jam, how much should I use? I’m not entirely sure, Jen. Just eyeball it! You want a thick layer, about 1 inch wide. I love the new look of the website but I like to print the recipes and with the new layout they dont print with the name of the recipe any more. And when I do print I end up with the whole post which, though enjoyable and entertaining to read, can be quite lengthy to print. Is this just a glitch for now? I love your cook book and can’t wait for the new one in October!!!! Your new site is AMAZING. Well done. I love anything and everything you make. Thank you for keeping it real and always making me laugh. I have ordered the new cookbook and wait with baited breath for it to arrive. Have really enjoyed your posts regularly…as a gluten free mom and parent, these recipes are awesome! Question- what do you think about using thick jam instead of cooking down dried fruit…looking forward to giving these a try! I am so excited about this one I had to comment. I absolutely do have fond memories of fig newtons. They’re pretty much my favorite cookie, and I have been so sad not having any :( I ruok I might try figs first. Thank you a million points. Also, the new look is fanfreakintastic. Hey, thanks, Kristy! And I’m so glad you like the new look. I’m digging it myself! Since the pop tarts were such a hit, this will be on our menu for homeschool cooking day this week. I’ve been looking for these for a long long time. Yay! The website looks so nice Nik! I had a newbie GFer over last night to give her the run down. Her 15 year old daughter had a complete meltdown that she couldn’t make chocolate chip cookies earlier in the day. She has only been GF for 2 weeks. She is in the gee eff hell of “what do I feed my kid?” I pointed her to your website and fabulous cookie recipes and she should be on her way soon. Thanks for being a life saver. Love the new blog redesign! I have to admit I am a lurker but I have loved all the recipes I’ve tried. I also bought your cookbook and it is my go-to resource. My 1 year old son is allergic to wheat so we are new to all of this. You have made the transition much easier with all your fabulous recipes. Can’t wait to try these! Thanks again for all your hard work! Thanks for pointing that out, Sam. My fabulous designer is working on it. It should be up and running soon. Promise! Nicole, what a gorgeous redesign! I love it. Just dropped my girl off for her first big day at pre-k and feeling a bit stunned that it went so smoothly (we’ll see how tomorrow goes). And I’m already planning to bake your delish chocolate chip brownies for an after school snack for my mini chocoholic, but these fruit newtons are an awesome second choice, esp since my daughter has been asking for fig cookies (what she calls newtons) ever since her diagnosis last year. Thanks for tackling the nostalgia items. You’re the best! Ordering the new cookbook asap :) Great cover, btw! Dana, I think pre-K is harder on the parents than on the kids. That’s why we wear sunglasses at drop off. ;) She’s been asking for figs, even in a cookie? She’s one interesting kid! Thank you for being such an active Shoestringer, Dana. I always look forward to hearing from you. :) And thank you for supporting the blog by buying the cookbooks! Thanks Nicole, I really appreciate your kind words :) I’m always so grateful for your daily posts. And thanks for the advice about sunglasses! Could’ve used those today, for sure.